The Priority Pass Global Airport Lounge of the Year awards have been running for the past 14 years, recognizing the best lounges in our program across the globe, as voted for by our Members. These annual awards let us celebrate those lounges which deliver exceptional service to our Members, and recognize excellence in the industry. Every rating you submit via the Priority Pass website counts towards the voting in the prestigious Global Airport Lounge of the Year Awards. And as a Priority Pass Member, you’re entitled to rate the lounges you visit in order to give us feedback, and improve your overall experience. Currently, you’re only able to rate lounges on our website, so in order to vote in the Global Airport Lounge of the Year Awards, you need to log in on prioritypass.com using your personal credentials. Once logged in, to rate your visits you need to click on the ‘Rate Lounges’ tab on your account page, and your lounge visits will appear there. If for any reason your lounge visit doesn’t appear in the list, you’re able to search for the lounge you visited, and manually select it to submit your rating. 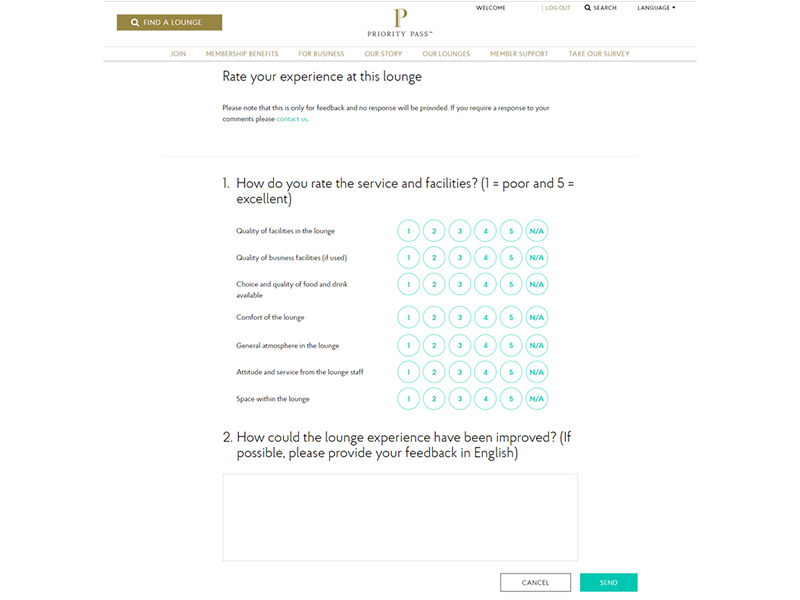 To rate, click on ‘Rate Now’ next to the lounge, and you’ll be presented with a list of seven different aspects of your visit, from the quality of facilities available, to space within the lounge. These are rateable on a scale of 1-5 and N/A if you didn’t use that particular aspect, or if it wasn’t available. You’ll also be given the chance to write in your own words about your lounge experience, and how it could have been improved. You’re currently only able to rate our lounges once you’ve logged in on the Priority Pass website. 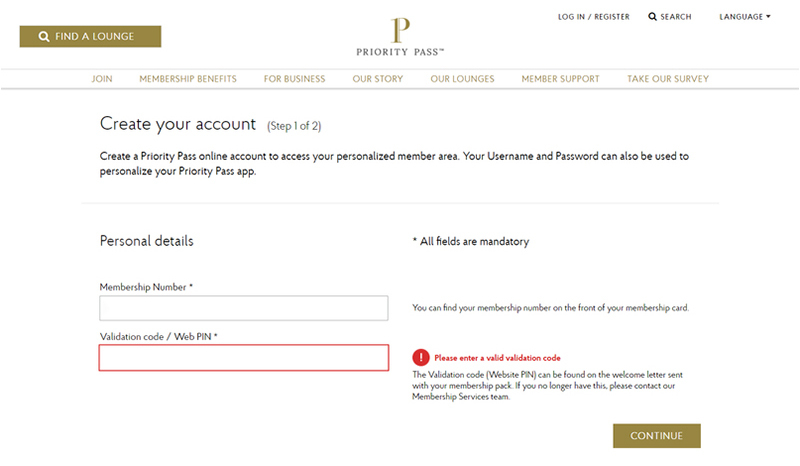 This means you need to have registered an account using your Priority Pass membership details. Go to prioritypass.com and click 'Register' in the top right hand corner. Create a Username and Password. Please note that the username and password you’ll create at registration can also be used to personalize your Priority Pass app. When all fields have been completed select ‘Create Account.’ The account registration is now complete! So now you’ve registered your online account, how do you log in? It’s simple! Click on ‘Log In’ in the top right hand corner of prioritypass.com, where you will be navigated to a page to enter the log in credentials you just created. There are two ways of logging in to your online account, either by using the ‘username’ and ‘password’ you have created, or by using your ‘membership number’ and ‘password’ – although we would advise everyone to create a username, and log in with that in the future. If you’ve forgotten the username or password you’ve created, select ‘Forgot your Details’ under the log in boxes, and you’ll be able to enter either your email address you’ve used on your account to have a username reminder sent to you, or enter your username or membership number to reset your password via the email address registered on your account. So now you’re ready to get voting, are and we are busy counting up the votes in order to make our big Global Airport Lounge of the Year announcement!